21 year old Justin Theriault of Fredericton and 17 year old Stuart Wight of Riverview took home the top two spots at the Canada Games Test in Summerside PEI this weekend. The event consisted of three stages. The first two events on Saturday - a 12 km time trial - won by Theriault, a 100 km road race - won by Wight were followed by Sunday's race - a 50 minute circuit race around down town Summerside which was won by PEI's Cory Jay and second place going to Wight with the same time. Once the overall result was tallied up, Theriault's time in the time trial was enough to give him top spot overall in a time of 3:53:41 with Wight taking second place at 3:53:54. Also competing in the event were the men's Canada Games hopefuls from PEI and four of the five NS riders already selected for the Games as well as a strong field of elite riders from the region including former National Team rider Cory Jay and Land Rover /Orbea rider Ryan Taylor. Both Theriault and Wight are considered top prospects to be named to NB's men's squad for the Games. Theriault races for the Radical Edge Club in Fredericton and Wight is just recently home to NB following two months of racing in Europe and the US with his club, Hot Tubes Development Cycling based out of Bolton MA. 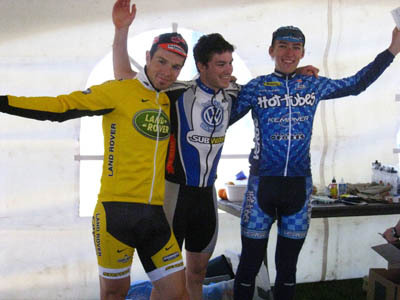 Next up for both riders is the next NB selection event for the Canada Games, a stage race in Dieppe to be held June 14. Details about this race can be found at www.velo.nb.ca.